May 2017 marks the 11th anniversary of PageMaps and to celebrate, we are giving away a $100 gift certificate to A Cherry On Top! We are also giving away three copies of the brand new CardMaps 5! For your chance to win, leave a comment on this post and share with us the one scrapbook or cardmaking tool you can't live without. We will draw random winners on Monday, May 29, 2017. This giveaway is open to everyone, everywhere! I cant live without my table cutting mat. In every project, be it card making or scrapbooking, I do paper cutting using blade. Aside from paper, scissors, glue and all the general stuff without which no scrapbooking would be possible? .. My 3M spray adhesive. And my Pinterest inspiration and sketch board. The tool I can't live without is my corner rounder. My ATG gun! Happy Anniversary! My ATG. Or my silhouette! Thanks for the chance! I love stitching on my layouts, and WRMK's Sew Easy is my favorite tool for that. thanks. Congratulations on your anniversary. I couldn't live without my Cuttlebug. It took a while for me to believe I would get much use out of one, but I used for almost every card I do. My Fiskars rotary blade trimmer - it's the tool I need no matter what project I'm doing. Happy anniversary! Here's to hoping for many more for you! Honestly, I can barely scrapbook without my 2 Card Maps books. They inspire me greatly. I must always have my paper trimmer, whatever project I do. I recently switched to a Fiskars trimmer with a wire guide (after years of an old Making Memories trimmer!) and have been happy with it. For me it's stamping that is my must have item. I have to say my Friskars Guillotine paper trimmer is my most used item in my craft room. Also my ATG gun is second best. Can't live without either one of them! 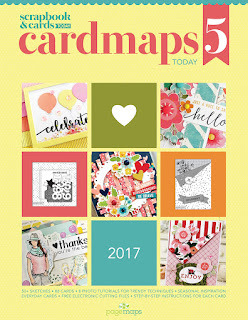 Thanks for a chance to win Cardmaps 5. Congratulations on your 11th Anniversary! I forgot to say was congrats on the anniversary. Congratulations on 11 awesome years! Thanks for letting us celebrate this special occasion with you! The cardmaking tool I can't live without is my die cut machine. I use it for every card I make. Whoop whoop congratulations on your 11th birthday. I cannot do without a good PAGEMAPS sketch, I love them. Thank you. I can´t make a layout without my distress ink. Love my Fiskars Paper Trimmer, but my latest crush is my QuickStik tool by We R Memory Keepers. Love it for working with sequins, etc! Congratulations, and a very Happy 11th Anniversary. I can't do without my paper trimmer. Yay! Congratulations!!! I can't live without my fiskars paper trimmer or my pink atg ! Thanks so much! I would have to say my ATG gun is at the top of the list. Happy Anniversary! All of us here have benefited by your accomplishment! I am primarily a scrapper, but make my share of cards. My go to tools are my small guillotine trimmer, my 12"Fishers paper cutter, and lately, nothing gets by me without getting Wink of Stella or Spectrum Noir Glimmer to add a little shine. Happy anniversary and thanks for all these years of inspiration and help! I can't live without my sharp scissor and my Scotch glue. Happy Anniversary! Thanks SO much for all those page maps. They have been so helpful and inspiring. So, my tool is my computer because it allows me access to work like yours. I like to be crafty but to actually come up with something all on my own is very rare. Wow you have been around for 11 years and I am just recently finding you! I have to have my ATG gun and trimmer at every project I do but I also need inspiration to get started. I almost never do a project without my silhouette. Keep up the good work! happy anniversary. I've been here since the beginning. still have printouts of early "maps" in a binder. I can't live without my brayer. I use it to make sure that things are glued down tight and as a bone folder when I can't find mine, lol. I love my Tonic Cutter. It is always by my side when I'm crafting. Happy Aniversary! Can't live without my silhouette! Happy anniversary! Thank you for all of the wonderful layout ideas! My Cricut and Silhouette are my most used tools. Happy anniversary!!!!! Can't live without a die cutting machine!!! Happy anniversary! Love all your great ideas. Can't work without my ATG gun or my Fiskers trimmer. Congratulations and Happy 11th Anniversary! One tool I can't live without is a 6" Art Deckle metal ruler my Mom gave me 20+ years ago. It helps me line everything up. Although my Misti is a very close second. Happy Anniversary, I don't think I could live without my cricut, I have gotten so attached to my cutting machine that it's pretty much used for all my crafts. You've been around longer than I thought. Congratulations! I can't live without my tweezers. It keeps my fingers out of the way when laying down smaller pieces. Happy anniversary! I can't scrap without my trusty Tim Holtz ruler! The one thing I can't live without is my self healing mat. It's been with me for 15 years! Wowza thank you so much and congrats! 11 years! Wow!!! Love your sketches. My favorite tool is the Tonic or Fiskar trimmers. Love this month's page maps! Two sb tools I can't live without are my trimmer and my ATG gun! Happy Anniversary! I can't live without my ATG! Happy Anniversary! Looking forward to many more. Can't lie without my Misti! Love,love,love it! I can't live without my ATG! Sounds like I'm not the only one! Happy Anniversary! The first thing I grab when scrapbooking is my paper trimmer. I can't make my cards without my paper cutter and my Tombow Xtreme Adhesive. Happy Anniversary!! Soon to be a teenager!LOL I can't live without my corner punch and paper trimmer. Congratualations on your 11 year Anniversary. Thanks for all those years of layout and card ideas! My computer is the most important tool for me. I use it for my Silhouette Cameo which is my 2 most important tool. Happy Anniversary! I can not live without my heat embosser. Happy anniversary! I think the thing I can't live without are my embellishments. Sequins, liquid enamels, nuvo drops, gemstones... not card or layout is complete without a little sparkle! Congrats on 11 years!! the one tool I can't live without is my die cutting machine. Wow can't believe it's been 11 years. I started with you way back when. It's shifted between scrapping and card making but I love your ideas. I couldn't live without my Kiwi Lane. So simple and easy to replicate or use your ideas for my pages. Way to go! Hi, Happy Anniversary. My, I can't live without is ideas from pagemaps and pinterest and my mat. I can't even think of the name of it right now, but it is so easy to clean, everything just wipes away. Happy Anniversary! Thanks for the opportunity to celebrate with you! My must-have tool for crafting is my 12" Fiskars paper trimmer. Every one of my projects begins with it. Happy 11th Anniversary! My how time has flown by. I would have to say that one of the things I can't live without when creating would be my Creative Memories Multipurpose tool. It is my go-to tool! ... sticking down, lifting up, positioning, whipping away, applying wet media it does it all! My trimmer with edge light is invaluable to me, I love being able to see exactly where I am cutting every tine! My Pagemaps sketches--and I'm quite serious! It's the start to 90% of my layouts. Wow 11 years Congrats and Happy Anniversary! The one thing I can't live without my Micron .05 journaling pens. I have to have my crop a dile. Can't live without that tool. I can't live without my sketches! It is usually the first thing I look at when planning my layouts. I have been keeping a binder full of them for years. Thanks for providing so much inspiration! The tool I can't live without is my Silhouette Cameo. I could not craft without my paper trimmer! :) Then my die cutting machines would be next. Congratulations on 11 years in buisness and thank you for all of your page inspiration over the years!! I couldn't Scrapbook without my Fiskars Paper Trimmer! I know I wouldn't be able to cut a straight line without it!! Well, besides my paper trimmer, which I couldn't do without, I love my Big Shot and dies...and embossing folders! Actually, I love all my supplies...but those are the ones I reach for again and again. Happy 11th anniversary!! My Cuttlebug - an oldie but a goodie. I need my big shot! Happy anniversary and thanks for the chance to win! Congratulations and Happy Anniversary! I can't create without my ATG tape gun. I have one of the older red ones, so it's a big honking of a thing but it never lets me down. For me, the tool I can never live without is Sketches. This is my starting point for any of my creations. I could not live without my Fiskars trimmer. It has been with me since I really got into scrapping in 2008. Before that I had dabbled with it a bit. After I got married I wanted to scrap my wedding photos and found archivers. Ahh the rest is history! I could not live without my paper trimmer. Happy Anniversary to you Page Maps!! I love all of my tools but my favorite right now is my Sizzix Big Shot. I use it for dies and embossing folders to add quick and easy embellishments to all my projects. Happy anniversary. There are so many tools I love but my favorite right now is watercolor brushes. Love creating backgrounds for cards and scrap book layouts. Happy Anniversary! I hope you do some celebrating! I can't live without my permanent adhesive and my paper trimmer!